The Run is held at the Moors Valley Country Park in Ashley Heath. Moors Valley is situated ten miles north of Bournemouth; it is signposted from the Ashley Heath roundabout at the junction of the A31 and A338, between Ringwood and St Leonards. Please note: Be aware that due to the rural nature of our location, some satellite navigation systems and route planners may not be accurate when using our postcode. Please cross-reference with the map shown. 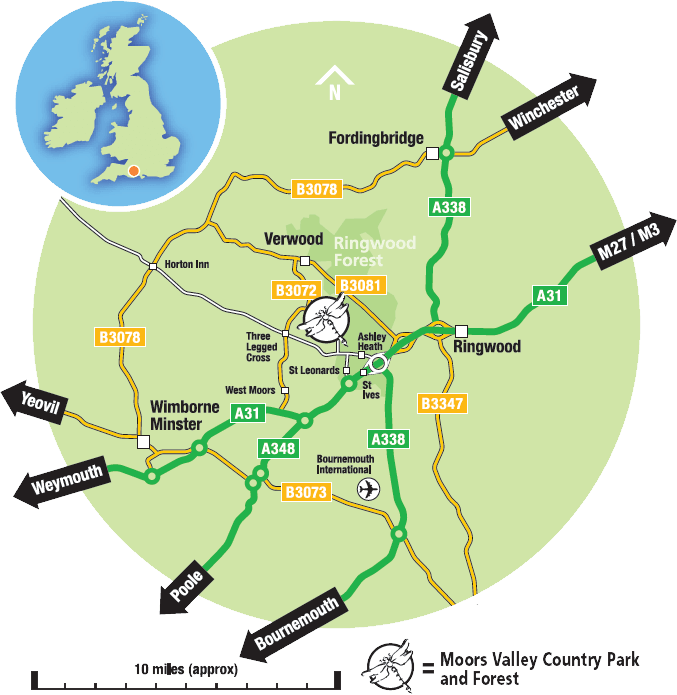 You can walk or cycle to Moors Valley from Ringwood or West Moors along the Castleman Trailway. You can access the north end of the Country Park from Potterne Way in Verwood by walking through the playing fields at Potterne Park. The number 38 bus service that covers the Ferndown and Ringwood area stops at Lions Lane, at the Castleman Trailway entrance to Moors Valley (just over a mile walk to the Visitor Centre). Please visit the Traveline website (click on all stops) or phone 0845 0727 093 for more details.